You might feel the world is against you at times and you simply can’t seem to find your way onto a path towards something positive where things will drastically improve for you. Many people all over the world feel this mental burden. It can lead to depression, hostility, anger and everything else. But one thing you may not realize is that the switch is between your ears when it comes to improving your life. This magical power is known as optimism. Some are born with it. Some learn it. Some adapt to it and acquire it with sheer hard work and willpower. But the truth is that we all have the power within us to become positive and climb towards success in life simply by changing our negative attitudes and becoming optimistic. When you are optimistic, suddenly the entire world changes around you. Your outlook changes. Your mood changes. You feel far more relaxed. You feel calmness. You feel suddenly free of stress and a mental burden. 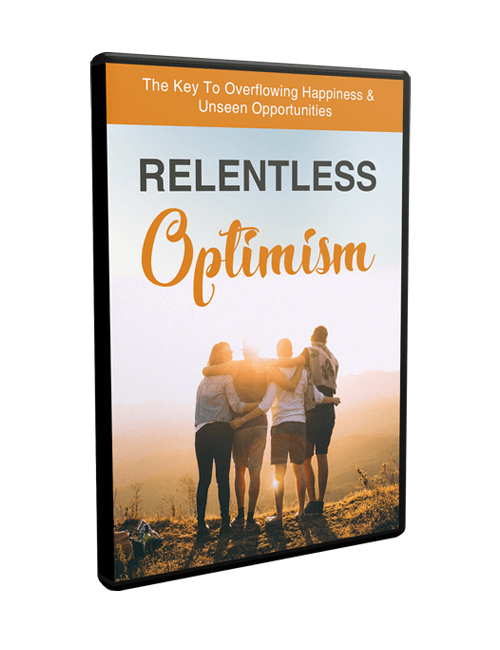 This video course which complements the Relentless Optimism ebook which help you get onto the path of positivity. You will discover how to change your outlook from a pessimist to an optimist, how optimism improves your mental and physical health, how to stay strong and driven when things are tough, how to free yourself of stress through basic habits, how to be more gracious and confident, how to change your habits and much more. When you’re ready to change things up and move towards becoming a better and more positive person and find success in your life, this course will help you get there. Download it now.